Just when you thought that Richard and Judy (UK TV presenters) Book Club was one of the most powerful selling tools in the UK; along comes Tesco supermarkets and Random House Publishers who are teaming up to launch the Tesco Book Club. Tesco will select one Random House Group title each month which will be featured in their stores nationwide, branded with Tesco Book Club branding. The books will be Tesco Special Editions with a branded bookmark and each will feature "exclusive extra content". The Book Club titles will also be available from a specially created website at www.tesco.com/bookclub. I wonder what knock on effect this will have on stores such as Waterstones and on-line buying? Can you imagine shoppers in Tescos walking up and down the aisle: "Soap powder - check. Tins of beans - check. The latest Random House promo - check." I’ve previously blogged about the murder of former Russian agent Alexander Litvinenko and it seems that the man charged by Britain of the crime denied involvement on Thursday, saying British intelligence (MI6 aka 6) and a self-exiled Russian billionaire were far more likely suspects. In the latest twist to a sensational murder case which has revived memories of the Cold War and seriously damaged British-Russian relations, Britain's main suspect Andrei Lugovoy sought to parry the accusations against him. Which made me wonder just how long will it be before a factional account is published? Step forward Tom Cain, Eoin McNamee, Peter Guttridge, Uncle Tom Cobbley and all …..
Scottish crime writer Ian Rankin, creator of the acclaimed Inspector Rebus series, said on Monday (28th My) his hard-drinking detective hero must retire this year but might well be back to tackle unsolved cases. Rankin told an audience at the literary Hay Festival that Edinburgh-based Rebus, who first appeared 20 years ago, would reach 60, the mandatory retirement age for Scottish detectives, in the next novel, due out in September. "There is every possibility that Rebus could be brought back to investigate cases that have not been cleared up," Rankin said. "I don't get the sense yet that the Rebus books are running out of steam." The Rebus stories have been adapted for television but Rankin said he did not watch them as he did not want the actors' voices to interfere with the characters' voices in his head. The books are set in Edinburgh, the Scottish capital, and have given rise to Rebus walking tours and made the pubs in which the detective drinks famous. But Rankin said the city had changed over the past two decades, during which Scotland has acquired its own parliament. "Edinburgh is again buzzing culturally and a lot of it is down to having the parliament there and a new sense of self-confidence," he said. ORGANISERS of the Essex Book Festival proudly announced this week that award winning crime writer Mike ‘The Ripster’ Ripley will be the new patron of the Festival for 2008. He takes over from Frances Wheen (both pictured here) The 2007 Festival involved 64 writers appearing at 50 venues across Essex, making it one of the biggest, if not the biggest, county literary festival going. Crime highlights in 2007 were: P D James, Colin Dexter, Barbara Nadel, Nicci French, Lindsey Davis and Andrew Taylor. Mike, as all readers of Shots knows, is behind the ‘Getting Away With Murder’ column, which is the internet’s only gossip column dedicated to crime fiction. And for those of you who don’t know who he is Mike is the author of the 'Angel' series of comedy crime thrillers and as well as being acknowledged as “England’s funniest crime writer” (The Times), he is a respected critic of crime fiction, reviewing for the Daily Telegraph, The Birmingham Post and The Good Book Guide. (Is that enough, Mike?) Being an Essex man he has been an active supporter of the Festival. He presented the very popular Morse evening featuring Colin Dexter and Ted Childs for the 2007 Festival and also took part in the launch event at Witham Library with P.D. James. One-time muse to fashion designer Vivienne Westwood, Sara Stockbridge's HAMMER, set in 1880s Whitechapel, the story of a matriarch and jewel thief, who is forced to go on the run when an early crime finally catches up with her, to Vivienne Schuster at Curtis Brown. Translation rights are represented by Curtis Brown UK. Andrew Davidson's THE GARGOYLE, "a densely packed story about a car-accident victim in the burn ward befriended by a mysterious woman who claims to be a stone carver in a fifteenth-century German abbey" (per NY Mag), has been sold to Gerald Howard of Doubleday, at auction, reportedly for "around $1.25 million,"
NYT bestselling author J.A. Jance's next three books in her Ali Reynolds suspense series, has been picked up again Trish Lande Grader at Touchstone Fireside, for publication beginning in January 2009 and following annually thereafter, with the second and third to follow in January 2010 and January 2011. Author of The Blade Itself Marcus Sakey's four books, following Ben Sevier to Dutton, for publication beginning in 2009, by Scott Miller at Trident Media Group (world). Wilbur Smith, author of The Quest and thirty other African adventure novels, talked to the Christian Science Monitor about what he was watching and listening to. ’I receive a great number of proof copies of soon-to-be published books ... asking for quotes [for] the dust jackets. I bin most of them, but two caught my fancy recently. One was The Accident Man, a first novel by Tom Cain. It is a cracking thriller woven around the death of Diana, Princess of Wales.’ You can read what Ali Karim thinks of The Accident Man. The New York Times investigates that perpetual publishing mystery: what makes a book a bestseller? The answer, according to the article, is: who knows? Books that are bounced from slush pile to slush pile go on to sell hundreds of thousands of copies. Others that seem to be surefire hits get pulped within months of publication. 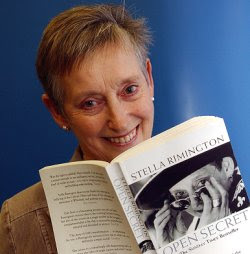 Anthony Cheetham, Chairman of Quercus Publishing Plc, announced today that the company has concluded a two book agreement with Stella Rimington. Dame Stella, a former head of MI5, has written three espionage thrillers, featuring fictional MI5 officer Liz Carlisle, for Hutchinson, where she was edited by Sue Freestone. She has now followed her editor to Quercus, who have acquired World English language rights. The third Liz Carlisle novel, ILLEGAL ACTION, is due to be published by Hutchinson in the summer of 2007. The first of the Quercus novels, again featuring Liz Carlisle, will follow in the autumn of 2008. ‘I’ve been very happy at Hutchinson,’ Stella Rimington commented, ‘but Quercus is a young, energetic company, and I feel it will be exciting to be part of their adventure’. Sue Freestone said ‘I’m proud to be publishing Stella again. No one can match her knowledge of the real world of espionage. And her heroine, Liz Carlisle, is not a million miles from Stella herself: highly intelligent, highly intuitive, and a delight to work with’. It’s not surprising the amount of writers who are turning to children’s fiction. Take scriptwriter David Gilman for instance. He is best known as the writer of the television series,"A Touch of Frost", which stars David Jason, and he draws on this experience in his first story for children, The Devil's Breath (Puffin, June, readership 10+). The first in a series called Danger Zone, it is a fast-moving adventure whose hero has innumerable close shaves with death. Unlike Gilman's quintessentially English detective series, however, the story is set in Africa, and the dramatic landscape facilitates the kinds of adventure that many European children would give their eye teeth for. For the last six years he has been the principal writer on A TOUCH OF FROST, with last year's episode garnering the highest audience share for a ITV drama in recent years and a BAFTA nomination for Best Single Drama. 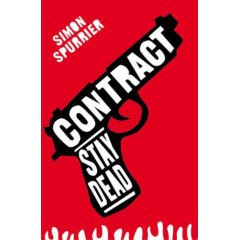 The Times has more on Headline's decision to release instalments of 25-year-old Simon Spurrier's first book, Contract, online for free. "Science Fiction publishers, like Orbit Books, have already published free novels online, but this is a first for a mainstream UK publisher." Piers Blofeld, of Headline, said: "The publishing industry has been tiptoeing around publishing books online. While there are obvious issues for publishers, the main point for me is that above all else, writers need readers." Blofeld denied making a commercial mistake. The book will be available online for a limited period, and from June 4 readers who can't wait to read the whole thing can buy it from the website. For all of you with a nervous disposition, look away now. 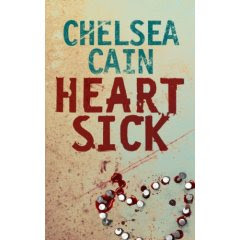 Chelsea Cain’s début thriller, Heartsick, which is part of a three-book series signed by Macmillan in a six-figure deal, and backed by ambitious marketing plans—opens with the glamorous serial killer Gretchen Lowell methodically hammering nails into a police officer's ribs and gouging a heart shape on his chest. Still reading? Okay: Later, Cain describes the slow murder of a schoolgirl by pulling out her intestines inch by inch with a crochet hook; other victims are dispatched with daily doses of drain cleaner that slowly eat at their insides. Ouch! You can Meet the Author and listen to Chelsea. Heartsick is out in the UK in August and published in the US by Minotaur September 2007. You have been warned! Last night I was in the company of John Connolly and his publishers, Hodder & Stoughton to celebrate the launch of THE UNQUIET, the lastest Charlie Parker chiller crime book. We met in the Dickensian-style courtyard of Bleed Heart Yard and enjoyed the champagne and food. Amongst the 40 guests were Mr & Mrs Mark Billingham, Barry Forshaw, Maxim Jakubowski, David and Daniel from Goldsboro Book. , and of course, Ali Karim (or Snapper Karim as he is known). As you can see from the photo we all had a good time and there will be a fuller report and more incriminating photos over in Shots Ezine. Christopher Reich's RULES OF DECEPTION, featuring an American doctor whose thrill-seeking personality has propelled him into war zones all over the world with Doctors Without Borders, who finds himself (and his late wife) at the centre of a global terrorist conspiracy, for publication in summer 2008, and the sequel RULES OF VENGEANCE, have been opted by Doubleday (US). David Talbot's book about Robert Kennedy BROTHERS: The Hidden History of the Kennedy Years is generating ink, but it's about the oldest John F. Kennedy story out there: that the president was "almost certainly the victim of a CIA-Mafia plot," as the NY Daily News puts it. NYT bestselling author and two-time Edgar winner T. Jefferson Parker's LA OUTLAWS is moving to Ben Sevier at Dutton, for publication in February 2008, in a two-book deal, by Robert Gottlieb at Trident Media Group (NA). From Christina Harcar at St Martin's Press, Julia Wisdom of HarperCollins has bought UK/Commonwealth rights to Victory Square, the final thriller in the Cold War cycle by Olen Steinhauer. At Blake Friedmann, Isobel Dixon has closed a new two-book deal with Hodder for the latest crime outings by her South African compatriot Deon Meyer, who also has a new standalone deal in Canada, where Marion Garner has signed him up for her World of Crime imprint at Random House. IN WHAT IS undoubtedly a coup for Simon & Schuster UK, Philippa Gregory, author of The Other Boleyn Girl among other much-praised historical bestsellers, has left HarperCollins to sign a global deal with the company. Gregory has been published since 2002 by S&S US imprint Touchstone and it was Vice President and Editor-in-Chief Trish Todd who negotiated the three-book deal with Gregory's husband, Anthony Mason. Suzanne Baboneau, Publishing Director of S&S UK will work with Todd on the books. The three novels will be set during the War of the Roses, thus predating the period explored in Gregory's most recent novels. Ian Chapman, UK MD, described the move as “a tremendously exciting opportunity for us in the UK and our other Commonwealth markets to work closely with our colleagues in the US to exploit even further the potential of this remarkable author”. The first of the novels, tentatively titled The White Queen, is pencilled in for 2010. Crime Writer Minette Walters talks to Psychoanalyst and Forensic Psychiatrist Cleo Van Velson. Minette Walters will hopefully be speaking about "how she became interested in murder and violence, where she gets inspiration for her physiological crime books and why she is intrigued by 'ordinary' characters facing situations of trauma that lead to responses that surprise not only the readers but the characters themselves." Minette has been described as the Queen of British Crime Fiction. Her first novel THE ICE HOUSE won the CWA John Creasey Award in 1992, her second THE SCULPTRESS won the Edgar Allan Poe Award and the third THE SCOLD'S BRIDLE the CWA Gold Dagger Award. Bookings Tickets £12/ £6 concessions (inc glass of wine). Tel 020 7388 8822 or via www.thebloomsbury.com. Booking fee applies. Minette Walters' next book is 'The Chameleon's Shadow' out in September. QUERCUS PUBLISHING HAS seen sales rise sevenfold and has moved into profit in its second year of trading, according to the company's results for calendar 2006, announced today. Hailing a turnover figure of £3.6m (£0.5m in 2005) and pre-tax profit of £0.3m (£0.1m loss in 2005), Chairman Anthony Cheetham said that, in his experience, "it is highly unusual for a new publishing company to record a profit margin of 9% so early in its history". Chief Executive Mark Smith attributed the exceptional sales increase to continued growth of in the contract publishing area allied to the trade publishing programme coming on stream. The trade publishing, of course, included Stef Penney's Costa Book Award-winning The Tenderness of Wolves and the launch of the Quercus crime fiction list. With gross margin improving significantly to 49.3% (32.4% in 2005), Smith stressed the importance of the company's contract publishing which operates on a lower margin than trade publishing, "but has very few risks associated with revenue recognition. A project is only truly begun when a firm order is placed that will allow the project to proceed profitably". The Quercus contract division printed almost 1m books in 2006, an increase of 300% on 2005 and that output is expected to increase in 2007 with new business in the US and foreign language markets in Europe and East Asia. The current year will also see the launch of Quercus Paperbacks (including the mass market version of Tenderness of Wolves), a children's list, audiobooks and a new website. Quercus raised £2.8m through a PLUS Market listing during the year and, said Cheetham, "2006 marks the transition from a newcomer with an interesting idea to a leading independent publisher with a sound infrastructure, a promising intellectual property portfolio, and adequate funding to pursue its further ambitions." It's nice to see so much hype around the great writer Daphne du Maurier lately...I would like to add my news. Lisa McDonald's MURDER ON THE CLIFFS, a historical mystery series featuring Daphne du Maurier as the amateur sleuth, to Hope Dellon at St. Martin's, in a nice deal, in a three-book deal, by Kim Lionetti at BookEnds. According to her agent's website, Lisa McDonald, an Australian author, also writes historical gothic romances as Joanna Challis.